Happy birthday, Royal Academy. Two hundred and fifty years old, and thriving. To mark the occasion, an ambitious rebuild has just been unveiled. And it warrants a noisy celebration. To my eyes, it’s the most promising refurbishment of a big London gallery since the unveiling of the Great Court at the British Museum in 2000. 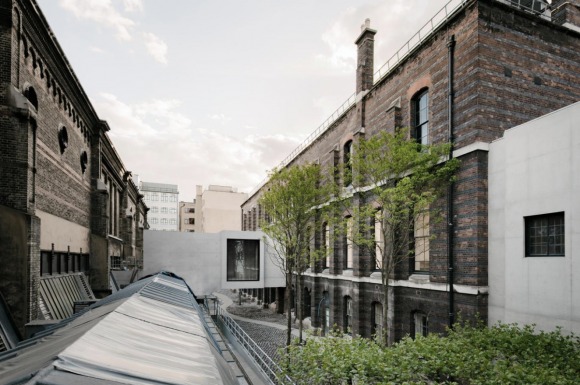 What has basically happened is that the old Royal Academy, the Georgian picture palace on Piccadilly, has been joined to a new Royal Academy, the large Victorian slab at the back that used to be the Museum of Mankind. Linking the two bits is a “bridge” of new spaces created out of forgotten corners of the site, and held in place by an elegant unifying scheme designed by David Chipperfield, the overall architect of the project. Chipperfield has rescued and spruced up an assortment of poky Victorian coal cellars and connected them with a grand staircase of impeccable minimalism. Apart from joining the two halves, this has enlarged the display areas available to the academy by a staggering 70%. And it has given us a selection of new spaces with new roles: a lecture theatre, a gallery for past academicians, a gallery for present academicians, a gallery for students studying to become academicians of the future. So it feels like more than an enlargement. There’s a sense as well of a whole new purpose. To which I say — and I hope you join me in the chorus — hallelujah. If ever an institution has had a chequered past, it is the Royal Academy. Indeed, “chequered” somewhat underplays it. It was founded in 1768, when a band of artists and architects petitioned George III to allow them to form a society “in which the Polite Arts may be regularly cultivated”. There was to be a school at which young artists would be taught to achieve the highest standards. And an annual exhibition, where members of the society would “offer their performances to public inspection” and flog their work. The profits from the second enterprise would pay for the first. From the start, therefore, there was a mercantile slant to the RA’s antics. Hazlitt, in 1816, duly complained of “a cabal… [that] think themselves bound to crush all liberal principles of art, lest they should interfere with their monopoly”. While our sister paper, The Times, hissed in 1830 that “the pride and self-respect which are the natural concomitants of genius will be more likely to keep a man out of the academy than bring him into it”. In the 20th century, it all got worse. Having fallen out of step with aesthetic developments everywhere, the RA became a retirement home for cravatted blimps with a passion for port. The process reached a climax of sorts in 1949, when the outgoing president, Sir Alfred Munnings, delivered the infamous farewell speech in which he drunkenly announced that if he saw Picasso in the street, he would kick him in his “something something”. During my own time at the watch, it has often been impossible to take the RA seriously. The best artists in the land — from Francis Bacon to Damien Hirst — have refused to enter “the cabal”. And the annual Pimm’s fest that calls itself the Summer Exhibition has been indistinguishable from a village fete. Indeed, the only sphere in which the academy has consistently impressed is in its exhibition programme. Under the inspired curatorship of Norman Rosenthal, from 1977 to 2008, there were so many shape-shifting displays, from A New Spirit in Painting to Sensation. More recently, the brilliant Abstract Expressionism exhibition of 2016 was a spectacular success, while the Charles I show that has just closed was one of the best Old Master displays I have seen. I used to wish the entire academy was as alive as its exhibitions, as I pushed my way through the line of port-pickled corpses that constituted its membership. But that was then. It is not now. Whatever the academy used to be, it began to cease being a decade or so ago, when a slow drip of meaningful presences started to accept the call. Antony Gormley. Tony Bevan. Grayson Perry. Tracey Emin. These were not red-nosed has-beens searching for a leather chair in which to puff a cigar. These were genuine players in the modern art world. A belief began to grow that the academy may finally have convinced itself the 18th century was over. As I write, there are scores of busy EU nationals scattered about the ambitiously conjoined building, shovelling grout into its tiles and frantically climbing its ladders. Finished it certainly is not. But their presence cannot disguise the tangible success of the new adventure. In fact, in my book it enhances it. No one expects a gathering of artists to be as efficient in their timekeeping as a gathering of accountants. What is clear is the promise and point of the enlargement. The gallery for past academicians is a triumph. It begins with a giant Satan, 15ft tall, painted by Sir Thomas Lawrence, famed Regency portraitist, yet outed here as a creator of outrageously ambitious religious fantasies. Beyond the enormous Satan, the rest of the works on display — by Reynolds, Gainsborough, Turner, Constable — were donated when these giants of British art entered the academy. They have always been in the collection, but hardly ever on view. Joining them in the room are some fabulous donations. The only Michelangelo sculpture in Britain, the lovely Taddei Tondo, has finally found a permanent space. 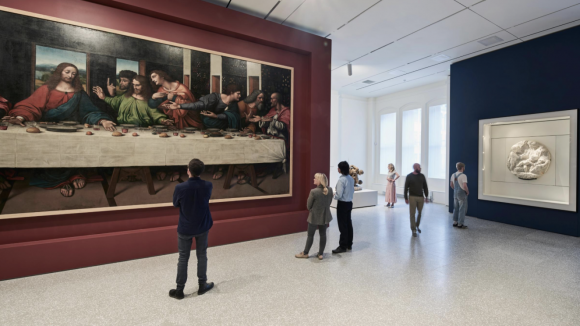 And I promise you will be knocked out by the full-size copy of The Last Supper, painted by Leonardo’s pupils, that has suddenly popped out from within the RA’s bowels. Another of the new galleries will be devoted to current academicians, and, even though the opening show here is by Tacita Dean, the tedious film maker who has recently been enjoying an unfathomable popularity among exhibition organisers, it is the best of the Dean shows now available in London. Devoted to landscape, it features her collection of four-leaf clovers and pebbles she found on the beach, as well as some fuzzy blackboard drawings that feel like contemporary versions of the Constable cloud studies next door. So it’s all very fey and English, but better than her horribly pretentious films. To unify the new spaces, Chipperfield has made ubiquitous use of a pale terrazzo floor, classy and Italianate, which he sometimes combines with red marble edgings. It isn’t just the spaces themselves that are linked by this recurrent floor. It seems also to unite the academy’s present with its past. I love the way inventive use has been made of the imposing collection of plaster casts that used to be employed in the Academy Schools as teaching aids. Freed of any teaching obligations, given their own atmospheric corridor to fill, these beautiful plaster Venuses and writhing Apollos are revealed, once more, as impressive artworks in their own right. It’s easy to forget that the RA remains a teaching institution: the only art school in London that is still free. By having the “bridge” between the two ends of the academy take us through the middle of the art school, Chipperfield restores a lost balance to the entire institution. 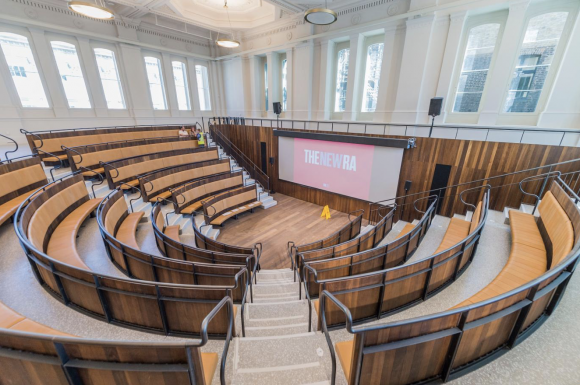 The best space of all isn’t an airy gallery or an atmospheric corridor, but the wonderful new lecture theatre fashioned out of the remains of the old Senate House of the University of London, which rises up through three floors. Treading another delicate line between the atmospheres of the past and the needs of the present, Chipperfield has created a half-moon-shaped auditorium in the Greek fashion, with an exciting Enlightenment mood. Wow. If ever a space demanded to be used for the exploration of new ideas, this is it. And that, finally, is what is most hopeful about this entire refurbishment. It really feels as if it has art and the pursuit of knowledge at its heart. Where the recent Tate Modern extension seemed mostly concerned with increasing the number of foyers in the building, this enlargement is so much more aware of its artistic responsibilities. Who would have thought it? The Royal Academy could be riding to art’s rescue!